While a teenager, O’Rourke acknowledged in an exclusive interview, he belonged to the oldest group of computer hackers in U.S. history. The hugely influential Cult of the Dead Cow, jokingly named after an abandoned Texas slaughterhouse, is notorious for releasing tools that allowed ordinary people to hack computers running Microsoft’s Windows. It’s also known for inventing the word “hacktivism” to describe human-rights-driven security work. Members of the group have protected O’Rourke’s secret for decades, reluctant to compromise his political viability. Now, in a series of interviews, CDC members have acknowledged O’Rourke as one of their own. In all, more than a dozen members of the group agreed to be named for the first time in a book about the hacking group by this reporter that is scheduled to be published in June by Public Affairs. O’Rourke was interviewed early in his run for the Senate. “I decided to write a book about the Cult of the Dead Cow because they were the most interesting and influential hacking group in history. They illustrated a lot of the things that I think are fascinating about hacking and security work. “While I was looking into the Cult of the Dead Cow, I found out that they had a member who was sitting in Congress. I didn’t know which one. But I knew that they had a member of Congress...And then I figured out which one it was. And the members of the group wouldn’t talk to me about who it was. They wouldn’t confirm that it was this person unless I promised that I wouldn’t write about it until after the November election. That’s because the member of Congress had decided to run for Senate. Beto O’Rourke is who it was...After more than a year of reporting, Menn persuaded O’Rourke to talk on the record. 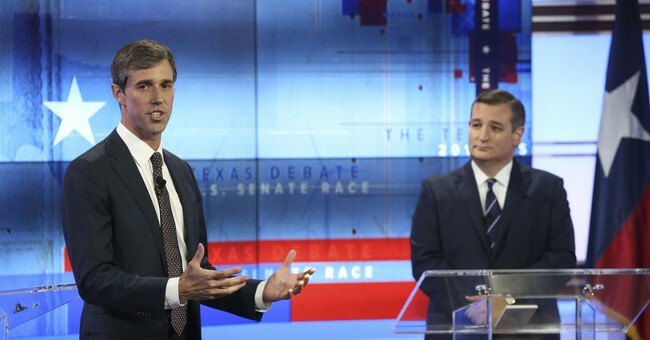 In an interview in late 2017, O’Rourke acknowledged that he was a member of the group, on the understanding that the information would not be made public until after his Senate race against Ted Cruz in November 2018. We should all respect and understand the need to pin down sources and confirmation before publishing a potentially-damaging story about a prominent political figure, but Menn wrote in his own story that he had "more than a dozen" named sources for his book. Are we to believe that there was no way on earth he could have gotten this story without this quid pro quo? It's possible, but many will have their doubts. If the subject of the story had been a Republican, would Reuters have decided that willfully withholding major information about a candidate's past was an acceptable journalistic decision -- or would they have pulled out all the stops to get pertinent facts to voters? I don't have to tell you how most media-suspicious conservatives would answer that question.
.@mviser: You alluded to the financial hurdles of this--can you release any of your fundraising figures over the last 48 hours? O’Rourke: I can’t right now. Beto’s not just competing against himself in fundraising in terms of matching the enthusiasm from last year, he’s competing against the rest of the field, of course. The pacesetter this year is Bernie Sanders, who raised a mind-boggling $5.9 million on his first day in the race. To that point Kamala Harris had led the field with $1.5 million in her first 24 hours. Sanders quadrupled her, serving notice to the other candidates that his base from 2016 was still intact and raring to go. Nothing else Bernie could have said or done in a day would have validated the sense that he’s the populist choice on the left as much as that fundraising number did. His supporters wanted to send a message by kicking in. You would think the same would be true of O’Rourke’s supporters, particularly given all the hype about his fundraising totals in 2018. If they wanted to show Bernie and the rest that their guy’s for real, a day-one bonanza was the way to do it. Did they provide one?...So far, total radio silence from him and his team. UPDATE - The number is out, and it's...yuge, even edging Bernie's enormous haul.